Brasserie 1605, located on the lobby level, brings delicious American fare to you. Indulge your palate at this brasserie for breakfast and lunch. This establishment is open daily from 6:30 AM to 2:30 PM.Savor a few drinks after a long day of work at Broadway 49 Bar and Lounge, located on the lobby overlooking broadway and times square. Enjoy this lounge between the hours of 11:30 AM and 12:00 AM.Home of the World Famous Singing Waiters. Enjoy some of the best diner food in the city with singing waiters entertainment, good fun for all.Only a few steps away from the hotel, this restaurant specializes in Southern Italy cuisine. Enjoy recreation amenities such as a 24-hour fitness center or take in the view from a terrace. Additional features at this hotel include complimentary wireless Internet access, concierge services, and a television in a common area. Take advantage of the hotel's room service (during limited hours). Meet other guests and eat at the complimentary reception. Continental breakfasts are available daily from 7:00 AM to 10:00 AM for a fee. 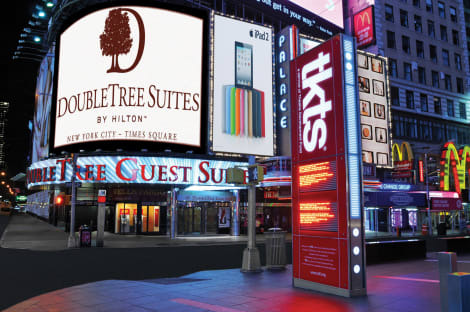 DoubleTree Suites by Hilton Times Square is the only all-suite hotel on Broadway in the heart of Times Square.Located at 1568 Broadway (at 47th Street and 7th Avenue), this modern hotel soars 45 stories above Manhattan and is surrounded by Broadway theaters, New York City's world-famous restaurants, shops, and museums. 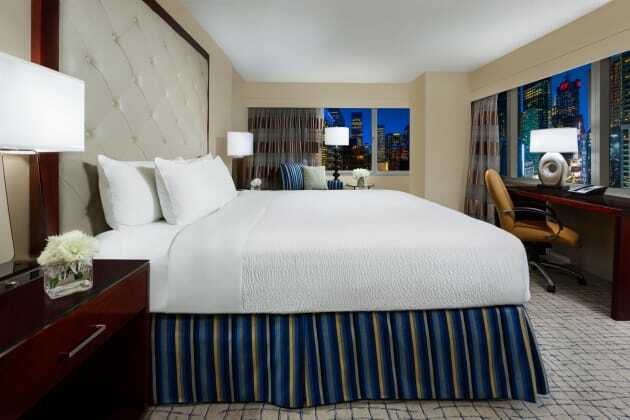 Overlooking the New Year's Eve Ball drop and directly across from the TKTS discount theater ticket booth, this hotel is in walking distance to Radio City Music Hall, Rockefeller Center, Central Park, Restaurant Row, The Museum of Modern Art, Carnegie Hall, St. Patrick's Cathedral and lively nightlife. 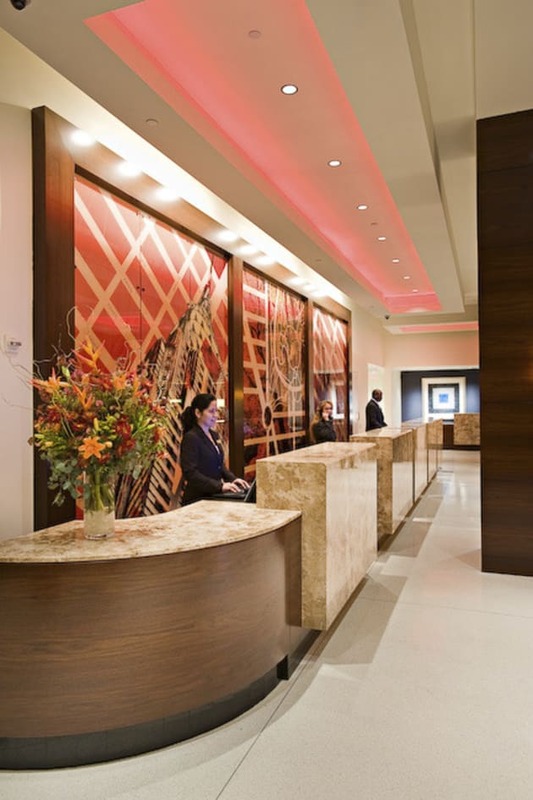 All major subway lines, public transportation and Jacob Javits Convention Center are nearby.DoubleTree Suites by Hilton Times Square has 460 two-room suites with living room, private bedroom and oversized bathroom. In-suite amenities include a sofa bed, two flat-screen televisions, wet bar, refrigerator, microwave, MP3 connectivity and a large work desk with ergonomic chair. 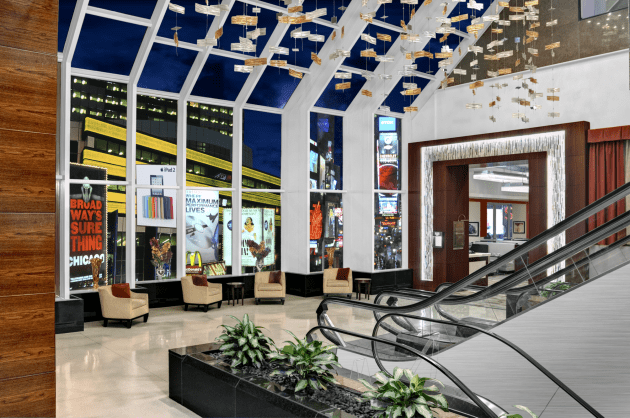 Additional hotel amenities include a renovated lobby with check-in area, Concierge/Theater Ticket Desk, Ad Lib lobby lounge, Gingers Restaurant, morning Coffee Kiosk, room service, complimentary 24-hour Fitness Center and complimentary 24-hour business center. The hotel has 10,000 sq. ft. of modern event space.The hotel is 100% non-smoking. Self- and valet parking are available. The hotel allows pets (under 60 lbs). There is 24-hour security onsite. Enjoy recreation amenities such as a 24-hour fitness center or take in the view from a rooftop terrace. 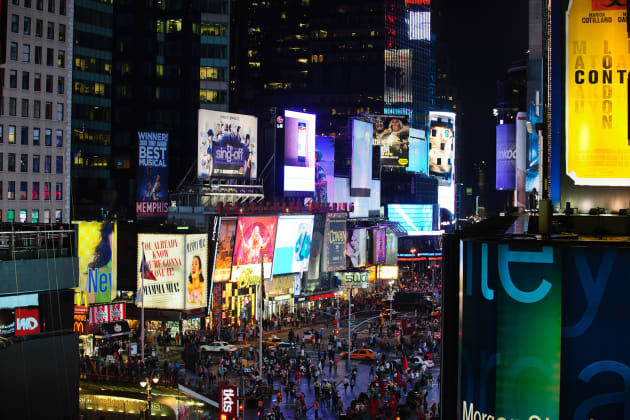 With a stay at Night Hotel Times Square in New York (Midtown), you'll be within a 5-minute walk of Broadway and Minskoff Theater. 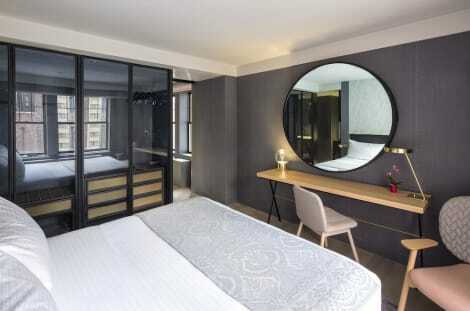 This 4-star hotel is 0.3 mi (0.4 km) from Times Square and 0.3 mi (0.5 km) from 5th Avenue.